Essaouira is a popular tourist destination in Morocco because of it's nice beaches, good surfing, and ancient walled medina. There are several great hostels around. Many hostels offer various tours of the area and some also offer surfing trips and lessons. 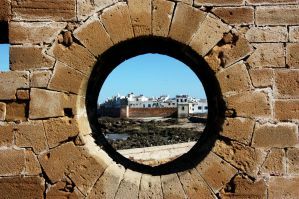 Essaouira has a laid back atmosphere that is a nice place to chill out for a few days. There are some great restaurants around, a good market, and some interesting historic sights. Whether you're interested in water sports or exploring the town, it has a lot to offer visitors. How much do hostels in Essaouira cost? Essaouira Surf Mellow Hostel is a relaxing and laid back place to stay where you can enjoy a mellow atmosphere after a day filled with activities. The hostel has several good common areas including a sea view terrace where you can soak up some sun. There's also an indoor lounge where many guests enjoy hanging out. The hostel has a variety of amenities available for guests. Breakfast is available for an additional charge and includes fruit, bread, jam, eggs, juice, tea, and coffee. There's also a shared kitchen available for guests. Often guests will organize meals together and listen to music or just hang out. If you're in town to surf, the staff can organize daily trips for you. Regardless of your experience level, there are plenty of options available including surfing lessons and equipment rental. The hostel also has private rooms and dorms available. Private rooms are either twins or doubles and dorms sleep up to four people. Atlantic Hostel is located in a historic family home that is in the heart of the Essaouira Medina. It's very close to Bab Doukala and sits on a quiet street near some of the town's best shopping and restaurants. It's also about a five minute walk to several good markets. The Port and Beach Skalas are about a ten minute walk away. The hostel has the standard amenities available. Breakfast is available for an additional fee. There are also security lockers and free internet available. There's a nice terrace that offers a great view and looks out over the entire medina and guests have access to a shared kitchen as well as a common area where they can listen to music or chat with other travelers. The staff are helpful and can organize any number of tours for you. Surfing trips are a popular option as well. Private rooms are either twins, doubles, or triples. Dorms sleep five, six, eight, ten, twelve, or fourteen people. Surf and Chill Hostel is another good option in Essaouira. It's located a very short walk from the main entrance to the city's ancient medina and it's also a short walk from the beach. Nearby you'll find many cafes, bars, and restaurants and guests can enjoy a nice breakfast every morning. The hostel also offers free wi-fi and hot showers. There are a variety of activities available to guests. The hostel runs daily surfing trips and if you're a beginner, there are lessons available. Equipment rental is also available. The hostel is staffed by experienced surfers and they are available to offer any advice or suggestions. There's also a rooftop terrace where you can take a yoga class or just enjoy the view. This hostel has both private rooms and dorms available. Private rooms are either twins or doubles and dorms sleep either four or six people. A good hostel for couples, solo travellers, and small groups. The Surf Lounge Hostel is another popular option. 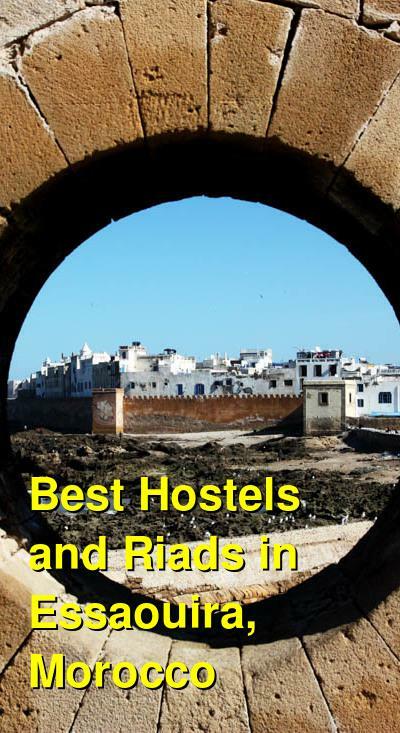 It's located in a riad that is in the city's old medina. It's about two minutes from the Skala, which is the city's coastal fortification. It's also about five minutes from the souk and seven minutes from the beach. This hostel also offers daily surfing trips that include transportation wetsuits, surfboards, lunch, and a two hour lesson. Free surfing is available through the afternoon and prices for the trips are reasonable. This hostel has a friendly and relaxed environment. The owner is helpful and it's not hard to meet other guests. It's a nice place to just sit back and listen to some music. Both private rooms and dorms are available. Private rooms include twins, doubles, and four bed rooms. Dorms sleep five or ten people.